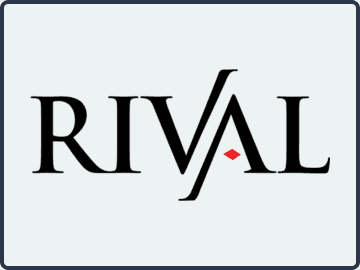 Rival Gaming launched in 2006 and is a popular software among US players known for their i-Slots line of games. Back in 2006, Rival Gaming first opened their doors. They have been in the business for over a decade, and in that time, they have developed a reputation for titles that focus on solid gameplay over flashy graphics. This is a company that’s licensed for operation in Curacao and that has never had any kind of scandals or other shady behavior behind them, and they are widely regarded as a very trustworthy company. Generally speaking, Rival Gaming is one of the two most popular software providers that accepts US players (the other being Realtime Gaming). This is important because you’ll sometimes see online casinos that feature games from both software companies, which are often the best options for players from the United States. With that having been said, Rival has a lot to offer players from other parts of the world as well. As we mentioned above, there are some sites that have both the Rival and RTG software, sometimes in addition to games from other providers as well. Because they don’t necessarily have the largest number of titles out there, players will benefit in a major way from these types of arrangements. The best Rival Gaming casinos will often be the ones that have the best game selections along these lines, though that’s only if they are trustworthy overall. The casinos that we recommend here have been vetted to make sure that they have all of their proverbial ducks in a row when ti comes to being trustworthy, which makes us feel very comfortable with recommending them. There are essentially two ways to play with Rival Gaming, but our current levels of technology actually cause an accidental, built-in third option, which we’ll look at below. The first option is a downloadable installer like you would expect just about any type of program to use. The issue here is that only players with computers that use some version of Microsoft Windows can use this downloadable option. Aside from that, players can also play with an instant play option that is completely browser-based. You can use this no-download option from any type of computer that has an Internet browser, such as those that run with Mac or Linux operating systems. The third option is a mobile option that will work for some smartphones and tablets. The basic idea is that you can use the instant play option in your mobile browser, but keep in mind that it wasn’t necessarily designed for this, so you could run into some limitations in terms of being able to access the controls in some of the games. This mobile option is rather limited, and it’s one of the few real weaknesses that the Rival Gaming software has as a whole. The biggest thing that this software company has going for them is their online slots. In particular, they have their line of what they call i-Slots, which are designed to have interactive elements that you can’t really find anywhere else. These i-Slots are based around telling a story or having a certain type of narrative play out during your sessions, and this leads to multiple stages of play, changes in how features work and a story that progresses each time you play. You can end up with something different each session, which adds a lot to the replay value and overall gameplay quality of the titles. Aside from their line of i-Slots, they also have a balanced selection of classic slots and video slots. Their classic slots often surprise people because they have such good gameplay values, and they don’t do what a lot of the competition does, which is be lazy with how they produce these three-reel titles. Their video slot selection is pretty solid, though they definitely have a focus on gameplay and not graphics, which leads to a somewhat limited visual appeal. It’s worth noting that, at the time of this writing, their Rock On online slot has the best payout with a 98 percent RTP (a 2 percent house edge, better than many table games). If you want to find out more about their slot machines, take a look at our list of Rival Gaming Slots. A good collection of the basic table games like craps, Baccarat and roulette have been produced by Rival Gaming, though they have somewhat average production values. They have two types of blackjack, single-deck and multi-deck, and you’ll find around six or seven video poker games, depending on the specific casino you play with. More than half of their video poker titles have maximum payout rates (with correct play) of over 99 percent, so they aren’t a bad option for players who prefer these games. Aside from that, they also have a few different casino poker games. This includes Let It Ride and Pai Gow Poker. Their sudoku game is basically a classic slot where everything is a scatter symbol, and they have a few scratch cards as well. Even though their game selection isn’t extremely deep, they do have a good variety of non-slot titles, which makes them suitable to be the only software provider at an online casino if need be. Wide selection of many different types of games, including atypical titles like sudoku. The i-Slots line of interactive video slots is a major asset, and one of the most important series of slots in the industry. Better classic slots than most providers that you’ll find in the casino software space. A good reputation that has been built up over more than a decade. No true mobile platform is available, though some devices can use most of the games on the instant play platform. Limited new releases with only a few new titles that come out each month. A limited number of games total, in spite of the fact that the games they do have cover a wide range of genres. Rival Gaming is one of those companies that has some major pros and cons, though their platform as a whole isn’t necessarily bad. With that having been said, they are definitely best cast in a supporting role, like if their games were added on to another platform as only one of a selection of games available at a particular casino. If you’re looking for an excellent, interactive online slot experience, then their i-Slots are definitely something that you should give a try. However, most of the rest of their slots are on par with some of the worst that Realtime Gaming, the other major US-friendly software provider, has ever produced, though you should have no problem finding sites that offer games from both providers.